So here are the last pages I created for 2014 – and I can’t wait to create my first pages for 2015! it took me a long time to admit i was an artist. i’m not really sure why. maybe i thought i wasn’t worthy of the title? to me an artist was someone who made a living off of their work. when someone asked, “where do you work?” or “what do you do?” i almost fumbled over a response, like “well, i was a preschool teacher for years then i quit to commit myself to my artwork full time…” how much easier (and less awkward!) to just admit – “i’m an artist”. last year i won a bottle of Dimensional Magic on the Mod Podge Rocks! blog. i’d never used the product before and decided to use it to make some pendants with images of my artwork. 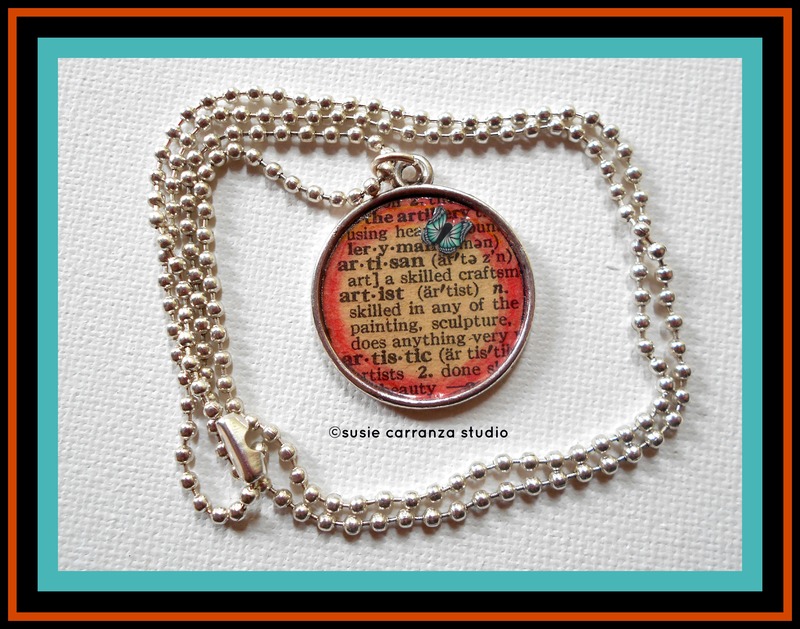 i also wanted to make some necklaces with old thesaurus pages. i love the way the pendants with the words came out, and i LOVE my “artist” pendant necklace. but i won’t lie; i didn’t wear it right away. but the more shows i do, the more work i sell on my Etsy shop, and as my work is starting to sell on our Arte de Nuestro Corazon site, i find my confidence growing. having a Facebook business page has helped me too: you’re interacting with so many more people online, answering questions and getting feedback from customers and potential customers. if you want to one day have a successful business, you need to step up.